Clean the mushrooms with a paper towel and slice them. :- Do not wash the store-bought mushrooms in water as they get water logged. Slice the onion to 1/4 inch thin slices. Thinly slice the garlic and cut the green chilly pepper into round thin slices. When it is warm, add the sliced onion and sautT till the slices become transparent. Add garlic and chilly pepper slices and mix the contents. Let it heat up for 2 minutes. Add red chilly powder and turmeric and mix well. Add required amount of salt, cover and cook them for a minute or two. Add the sliced mushrooms to this and mix well. Cover the pan and cook for 2 minutes. Remove the cover and let it get fried by stirring the contents occasionally(5 -6 minutes). When the oil starts to sizzle around the mushroom slices, Mushroom fry is done. 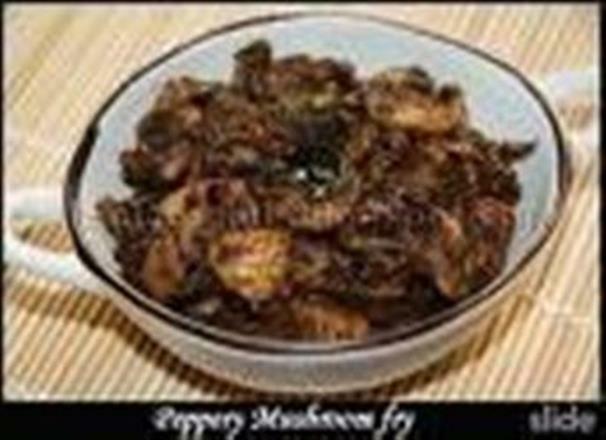 :- Serve Mushroom fry with rice. It is very easy to make and is very tasty. Makes a good combination for rice. 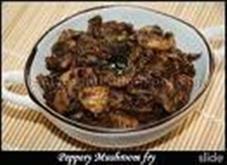 Its very easy to cook and tasty too..
just nw i tried this recepie.its the first time i am cooking mushrooms.i made it by adding garam masala.its verrrrrrry tasty!! I used to make something like this but I used to put some ground black pepper and garam masala. I tried your recipe and added garam masala and ground pepper, it came out very good. I liked it very much, my husband liked it too. 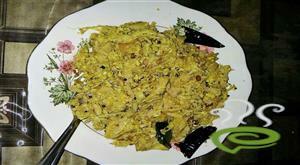 We had this recipe with chappati. Very good, everyone should try this. Thanks! A place where I only use mushrooms for pasta dishes....this receipe made my day. 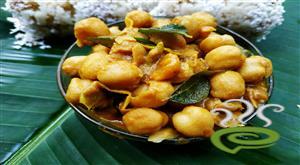 Simply yummmyyyy...Loved it but I also added masala and chopped corianda to it. The receipe is very good. Always i used to wash the mushrooms, like keeping in water for 20mins and removing the upper layer but for the first tme i did like this it was vveerryy... nice. Thank you. deadly recepie...my husband loved it!! Very Very tasty!! Best Mushroom Fry I have tried! Excellent! I loved it a lot. I added a little bit of garam masala to it and it made it even better. 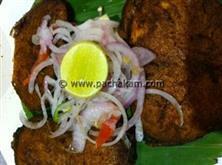 good if u fry it very well, if u add a bit of meat masala it will taste like meat fry. Taste is really good and can be made very fast. I made it and gave to my British friends. They all liked and i had to give the recipe to all. It is perfect with a bottle of lager. As some one said before, a pinch of black pepper add to its taste. I have garnished it with chopped coriander leaves. I love it. hi. 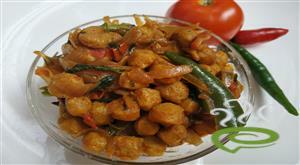 I have tried this recipe with a combination of red & green capsicum.Its real good.Thanks a lot. 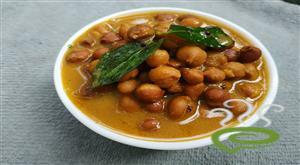 Try adding pepper powder too along with the spices & that really makes it more tasty.Thanks once again. Very tasty and so easy to make! U deserve the 5 stars for this recipe. wow this is so tasty. I made it with red capsicum and it came out real tasty.Thanks a lotttttttttt. Very tasty. Keep it up. My husband liked it very much. Very easy to make and so tasty. we love this recipe. I didn`t even like mushrooms before. njan ithu undakki nokki. pakshe sambhavam avasanam Kolamayippoyi. kettiyonte aduthu ninnum kanakkinu kitti. this was the first time i tried something with mushroom,its really good. Great!!!! !Easy to prepare and very tasty. Easy to make and tastes great..Thanks for this recipe..
everybody loved it.......if u r using canned mushroom add garam masala tooo for extra flavor. This recipe is good and very simple. must try it.